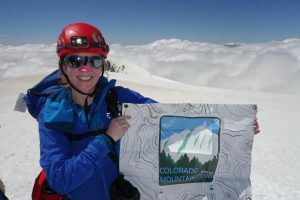 Get to know Makayla Braden, a Colorado Mountain Club Trailblazer and High Altitude Mountaineering School Graduate. 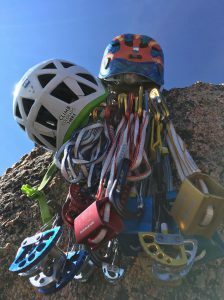 A look at some of the gear the TSC used on their summit attempt. Makayla shows the CMC some love on the summit of Mount Adams, 12,280′. 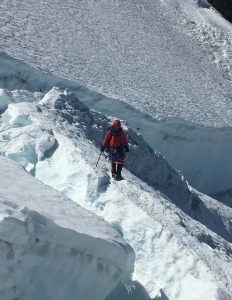 The version of Makayla Braden that exists today, the veteran CMC member and the accomplished technical climber and mountaineer, is a version of herself that did not come into being overnight. It is a version of herself that took patience and a positive, adventure-driven spirit. It is a version of herself that exercised grit and determination in the midst of tribulation. Her path to find and follow her passion is as much a story of learning and growing from that tribulation as it is of an unrelenting lust for exploration. From there, Makayla focused on honing her skills and expanding her horizons, and she joined CMC to do just that. She joined the Club just over three years ago, and her membership got off to an interesting start. “I didn’t join in time to get into a lot of the summer programs that year, and I was interested in all of them,” she recalled, “so while I was waiting it out I actually stalked a couple of trip leaders, but I’m friends with them now,” she joked. After squeezing her way into a few programs, she was off and exploring. Makayla then got involved in more rigorous and technical trips and classes with the CMC where she began to not only develop her passion for climbing and mountaineering, but also learn and bond with others that shared her interest and drive to improve. It was during that time that she found the group that she climbs with to this day. They call themselves the “Tiny Sticker Crew” or the “TSC” because of the tiny Colorado stickers they have cut out and placed on their gear. 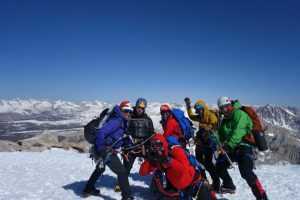 After a while, the TSC decided to collectively progress through the CMC’s High Altitude Mountaineering School (HAMS). They yearned to travel and climb as a unit, and HAMS was the perfect way to prepare them. A trip to Washington’s Mount Rainier was scheduled at the conclusion of classes to celebrate the group’s hard work and dedication. After all she’s accomplished, Makayla continues to set new goals and dream of bigger challenges. Something she knows for sure: she wants to scale big mountains. While they might be considered pipe dreams at this stage, she’s considering Denali and Everest, and no one should be surprised. When asked about the future in general, she simply declared: “bigger, higher, better, more.” Not a bad motto to live by.